Bonus: Was Siemens’ Acquisition of Mentor a Good Move? Wally Rhines is like the Energizer Bunny of the EDA industry. He’s a favorite and frequent on-stage presenter at industry events. Perhaps that’s because he’s an all-around nice guy, but, more likely, it’s because his presentations are so darn interesting. Latest case in point: his presentation titled, “Is Past Prologue? The Future of the PCB Design Industry,” given at the recent PCB West conference held in Santa Clara, California. Just before starting, Wally said off-the-cuff, “I have to give a PCB talk every few years,” just to remember Mentor’s roots. Most of Wally’s talk covered the history of PCB CAD, but he finished with a 1-year retrospective covering Siemens’ purchase of Mentor. Back in the days of Rubylith film and black crepe Bishop layout tape, people wondered why we’d ever need PCB CAD. 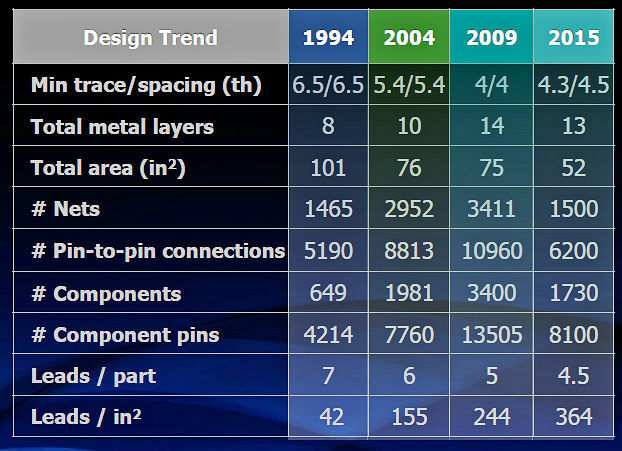 IC CAD was taking off at that time, and IC design was similar to PCB design—both were lithographic processes—but back then, Moore’s Law ruled IC design with an iron fist, and it was readily apparent why we needed IC CAD: ICs and IC design were quickly becoming far too complex for manual design techniques. Not so much PCB design. At least not for a while. Eventually, Moore’s Law caught up with even PCB design. IC pin counts were growing, and there were more parts on the board to connect. PCB layout reached a point where you could no longer manually lay tape or even draw the board connections by hand. Mentor Graphics, founded in 1981, took off quickly, and revenues surpassed $200 million by 1987. Then, something bad happened. Mentor really started listening to its customers, who said they were having too much trouble getting 3rd-party software to work with Mentor’s design tools. There were no standards for interfacing these tools, and there was no standard database for all of these tools. That’s when Mentor started to develop Version 8.0 – the Falcon Framework – to address these customer concerns. However, there was a dissenter in Mentor’s ranks. The PCB design team didn’t buy into the Version 8.0 plan, and instead of rewriting and fully integrating Mentor’s PCB design tools into Version 8.0, the team simply built a wrapper for the software with an interface to the Falcon Framework. This rebellious move turned out to be quite fortuitous because, incredibly, while revenues for the rest of Mentor’s tools nosedived as Version 8.0’s release became later and later, sales for the company’s PCB tools continued to climb. At the same time, Mentor’s field operations also decided to take matters in hand and deal with the rolling disaster of Version 8.0. After all, they needed something to sell, and Version 8.0 was not going to be it. In its search for new customers and incremental revenue, the field team hit upon selling Mentor’s schematic drafting tools to Freightliner, a Portland truck manufacturer just up the road from Mentor’s HQ in Wilsonville, Oregon. Why does a truck manufacturer need schematic drafting tools? They were a good fit for designing and documenting the complex wiring harnesses in Freightliner’s trucks, and it turned out that lots of companies designing wiring harnesses have the same design and documentation needs. The field-developed wiring-harness tool appeared as Mentor’s Cable Station in 1991. It eventually became a separate $100 million business for Mentor, and it’s one of the things that prompted Siemens to purchase Mentor nearly three decades later. 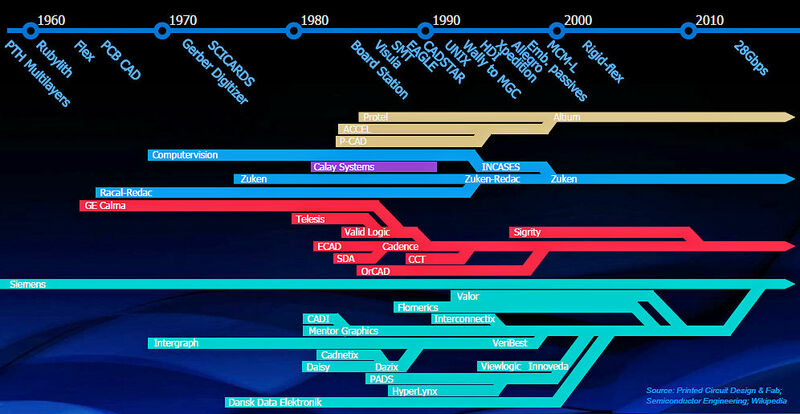 In 1990, the three leading PCB CAD vendors were Mentor, Valid, and Cadence. (Daisy had merged with Cadnetix in 1988, and the volatile mixture turned explosive, with DAZIX filing for Chapter 11 bankruptcy in 1990 and knocking the company from the top three competition.) Then in 1991, Cadence bought Valid in a move to become the undisputed market leader. Cadence discontinued all of the Valid products, hoping to drive Valid’s customers to equivalent Cadence tools. However, this move had the opposite effect. The big re-evaluation forced by the discontinuation of Valid’s tools eventually killed a lot of the Cadence PCB business, too, as many Valid customers defected to other vendors. Joe Costello, then President and CEO of Cadence, later admitted in an October 1997 Forbes magazine interview that Valid was clearly the worst acquisition he’d made. The combination of Mentor’s heavy reinvestment in PCB design tools after the failure of Version 8.0 and the aftermath of Cadence’s unfortunate purchase of Valid drove the two companies in opposite directions. Mentor focused on the PCB business, which had continued to thrive, and Cadence focused on the IC EDA business, which had not been hurt by the purchase of Valid. Cadence still trails Mentor in the PCB market by a significant percentage. However, that was not the end of interaction-by-acquisition between Mentor and Cadence. In 1996, Cadence announced it was buying CCT (Cooper & Chyan Technology), which was a Mentor spinoff. About 85% of CCT’s business was an OEM deal with Mentor for CCT’s automated router, and, when the sale to Cadence was completed in 1997, Cadence generously gave Mentor one year to find a new automatic router (or to prepare to go routerless). Mentor was about to be up the creek without a router, but providence stepped in. Improbably, Intergraph had an excellent automatic router that it acquired by purchasing the distressed remains of bankrupt DAZIX (Daisy/Cadentix). Intergraph had eventually spun this PCB design-tool business off as Veribest. Although Mentor had previously made inquiries about purchasing Veribest, for three years according to some reports, Intergraph hadn’t been interested. Then something happened. Intergraph suddenly decided to sell, and Mentor—now driven into survival mode because a PCB tool vendor without a good automatic router can’t expect to live very long—completed the deal and cut the sizeable check to pay for it in just six days. The check was cut on a Sunday and the purchase was so accelerated that Wally was forced to sign a document taking full responsibility for the expenditure. Why did Intergraph change its mind? In an EDN article published in 1999, Intergraph CEO Jim Meadlock was quoted as saying “While we think we had an extremely good set of products, we had a hard time making any money [with Veribest]. We did set up Veribest to make it an independent company, but we never quite got the economy of scale to be there. (An initial public offering) was the hope, but we finally decided that we weren’t going to make it on our own.” That had been awfully good news for Mentor. By the year 2000, PCB design and routing revenue had started to flatten and, as the chart shows, the number of mergers and acquisitions also diminished. However, compensation came in the revenue rise for PCB design analysis tools, which was triggered by the growing battle over design signoff. PCB designs had become so complex that approval from independent signoff experts was now needed for a variety of design domains including signal integrity, thermal, vibration, and design for manufacturing. Each of these domain experts used a different set of complex design-analysis tools to determine the domain-specific suitability of a design. Many designs were sent back when submitted for signoff approval, and this became a real point of friction between the people creating the designs and the people responsible for signoff. As a defense, designers felt that they needed their own set of analysis tools so that they could analyze their designs before submitting them to the signoff experts. The PCB designers asked their tool vendors for easier to use, less costly tools with similar analysis capabilities. As a result, said Wally, the growth market in PCB tools these days is in signoff analysis. And that’s the future, said Wally. The future is in early verification where tools must handle increasingly complex models while becoming easier to use so that more people can use them. Coincidentally, expensive signoff experts are becoming scarce, but the need for signoff verification remains. PCBs and system designs are getting so complex that they need to be thoroughly analyzed and virtually prototyped long before they’re built. Wally provided two excellent examples of circuit boards with state-of-the-art complexity and two more examples of complex systems. The first circuit board, from BAE Systems, is for a military head-mounted helmet display. The board incorporates some 2300 parts, has more than 30 voltage rails, and has more than 12,000 vias. Signoff was required for signal and power integrity, cost, manufacturability, reliability, thermal conformance (must not cook the pilot’s head), and form factor. The second circuit board design, this one from Fujitsu, is a mainboard for high-performance computing. It incorporates more than 4500 components including a 165W, 28-core CPU. Signoff was required for signal and power integrity, cost, manufacturability, and reliability. Mentor tracks leading-edge board complexity through its PCB Technology Leadership Awards program, started in 1988. With 30 years of design entries, this program allows Mentor to track changes in PCB design over time. There are surprises in this data. Most of the numbers have gone up, mostly modestly. However, the total board area has shrunk by 50%, which has caused the number of leads/in2 to jump nearly an order of magnitude in the above table. Not shown in the table: the average design time has stayed constant at about 18 weeks despite the complexity increases and design-staff reductions. The first complex system that Wally discussed is ASML’s EUV stepper. Each EUV stepper costs at least $120 million. The EUV system incorporates 1200 circuit boards, more than 100 control units, 4800 wiring harnesses, and more than 4000 sensors. Building physical prototypes of such a system is extremely costly, so engineers need a high confidence in the design before fabricating the first prototype. Wally’s second system example was the autonomous self-driving car. In 2016, Toyota’s CEO Akio Toyoda said that the design of a level-5 autonomous vehicle needs more than eight billion miles of testing to prove the design. There’s no way to get this level of testing with a reasonable number of physical prototypes in any reasonable amount of time. If you tried to get eight billion miles of testing with physical prototypes, said Wally, you’d need 500 prototype vehicles driving 60 mph for 24 hours per day, every day of the year, for 30 years. Clearly, that approach is wholly impractical. 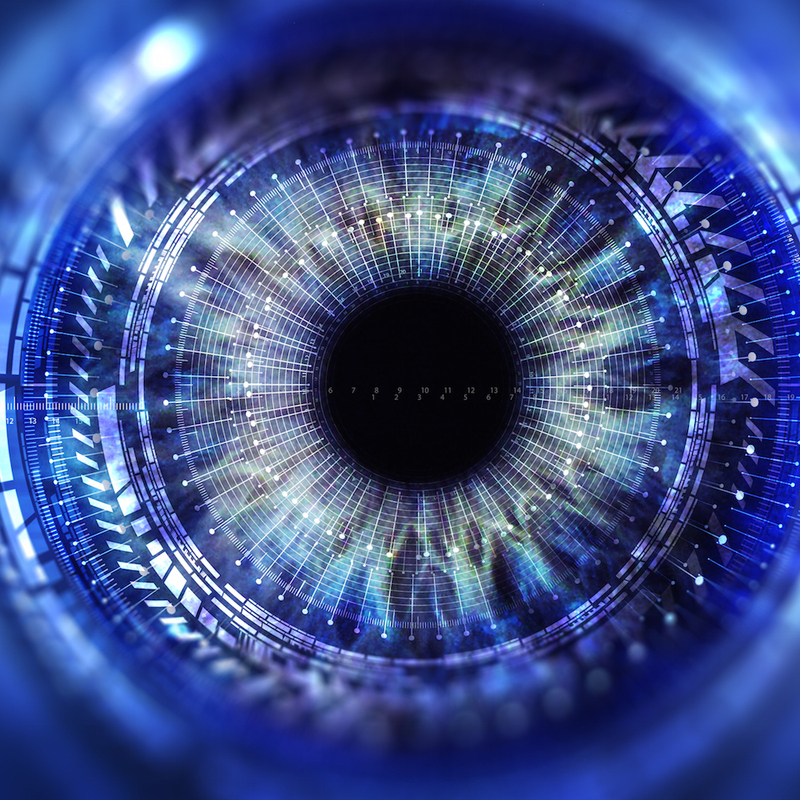 Testing would not be completed until well after the singularity, at which point it wouldn’t matter, would it? What’s needed is a digital twin that works and acts like the design but runs faster than real time, virtually on a computer (actually a large bank of computers). The digital twin integrates recorded sensor and synthetic traffic information with models of the car’s sensor array, drive train, steering, and braking system. IC design has been virtual for 40 years, said Wally. Now it’s time for other types of system verification to go virtual as well, because the complexity of these systems demands it. Wally then spent the last few minutes of his talk discussing Mentor’s acquisition by Siemens, which has spent more than a decade developing itself into the world’s largest design software vendor. Siemens plugged Mentor into an electronic design hole it had in its lineup of engineering software segments. With 14 months and a full fiscal year under its belt post acquisition, Wally was able to say unequivocally that the acquisition has been good for both Siemens and Mentor. Mentor’s revenue and bookings are up; its contract renewals are up; and Siemen’s software revenues across its divisions are up as well. “You still can’t do integrated design cleanly,” said Wally in a callback to Mentor’s unfortunate experience with Version 8.0. We’re doing integrated designs; it’s just that we’re integrating them by hand. In the end, the lesson of Version 8.0 (relearned over and over again) is that you can’t turn software engineers into hardware engineers with some sort of magic design tool or framework. Similarly, you can’t transform mechanical engineers into electrical engineers. Each group has a customary design style developed over many decades of practice. Instead, said Wally, you need the various design tools to support standard interchange formats and to use only the required pieces of design information, supplied by standard APIs, and a lot of data management. For Wally Rhines, that’s a lesson learned from a quarter-century of hard experience as Mentor’s CEO, and that seems to be exactly where Siemens is headed. Taking a break from learning Upverter, Polarfire, PCI-E for this great article and reference data! And a bit timely in many ways. Things have certainly come a long way since I started doing 4:1 Bishop tape on Vellum PCB layouts in the late 60’s for CED in Camarillo. And a long way from early rack mounted PDP-11 minicomputer PCB design systems we used in the 70’s and 80’s. The biggest change however is the impact of designs shifting from low function TTL packages to high density VLSI packages, combined with the steady march of larger and larger programmable logic systems with high degrees of systems integration …. SoC’s and the like. Desktop CAD/EDA/PCB design systems, from early Mac512 (MacPCB, McNet, McPLA), and forward after MS Windows, have moved PCB design into the hands of every day engineers working in small shops and hobbiests. Back in 1985, with MacPCB on a Mac512 we did two full featured shoe box sized Motorola M68020 desktop UNIX server designs in a few weeks each. Four layer, 25mil space/trace high density layouts to Gerber. While large corporate EDA/CAD/PCB design systems have gotten awesome … so have lower end design tools. I’m blown away with the feature set in Upverter … and will probably move a new high density Polarfire hypercube accelerator design over to Upverter after I finish the initial layout with geda/PCB scripting. The Upverter design files are also text, and look like we should be able to convert the PCB scripting tools to produce them too.